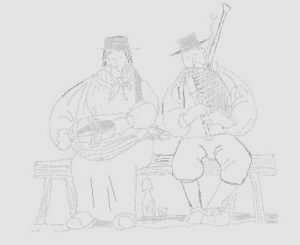 From within The Leeds Waits comes Stanhoppe's Musick, a versatile duo or occasionally a trio, performing on assorted wind instruments like bagpipes, shawm, fife, flute, recorder, crumhorn and rackett, plus strings including hurdy-gurdy, cittern, guitar and harp. See them here. Stanhoppe's Musick has broadcast a number of times, including "The Music Machine" on BBC Radio 3, played at many authentic venues throughout England, and at events for organisations such as English Heritage, The National Trust and local authorities. The group has also performed at many historical reenactments. The picture shows them playing cittern and English bagpipes outside Astley Hall in Chorley, Lancashire. Stanhoppe's Musick are the Regimental Musicians of Tower Hamlets Trayned Bands and 17th Century Life and Times. Stanhoppe's Musick is available for hire for weddings, banquets, parties, and other events, particularly those in period properties or with historical themes.